After a terrific year for Ballincollig LGFA, our girls from all age groups applauded their achievements last Friday night at our Celebration Party in the GAA. Our Chairperson, John Oldham opened the evening welcoming the huge crowd of players and parents and expressed his delight in the growth of the Club as well as it’s achievements in the past 12 months. Our Secretary, Aileen O Flynn thanked the local businesses that had made contributions to us over the year. Our Club won a competition in our local Lidl Store, based purely on the Community choosing our Club when paying for their groceries; Quish’s SuperValu were thanked for their donation of gear to the Club – footballs, bibs, training equipment. Our local Dunnes Stores and Quish’s were thanked for permitting our annual Bag-packing, as was Ballincollig Parish for enabling our Annual Church Gate Collection. 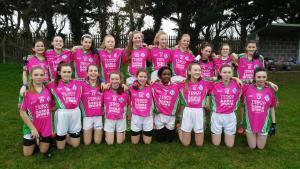 The Club benefited greatly from last year’s Gaelic4Girls Programme and Cork Sports Partnership under the guidance of Maurice O Sullivan were thanked for their donation towards gear for the programme and training of our Mentors. Our own Belle of Ballincollig, Chloe O Connor presented our Under 10 girls with their Mid Cork Participation Medals and they were then treated to Pizza supplied by local business Industrial Installation Services Ltd. Our own Aobha Hickey presented our super Under12s with their Mid Cork Medals. Aobha spoke to the girls on the importance of sport and acknowledged the role that parents make in encouraging their girls to continue in sport. She spoke of her own experiences and friendships that she has made through sport over the years. Aobha brought with her the U21 All Ireland Aisling McGinn Cup which Aobha and her Cork teammates won this year. Maria NicCárthaigh, the Under 12 Manager recalled the great competitive year that the girls experienced, ending in the highlight of winning the Mid Cork B2 League. Our Chairperson then called on the Founder of the Club, John Fitzgerald to present our Minor Ladies with their Mic Cork Medals. 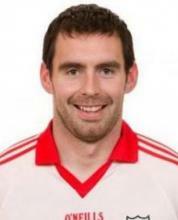 John who also trains the Under 14 Cork Development Squad had trained many of these girls from U10s up to Under 14 level. Team Captain, Roisín MacManamon in turn made presentations to Paddy, Tony, Maria and Aileen as Team Mentors for all the hard work that they had invested in the team during the year.Additional achievements were also acknowledged on the night: - Sinéad Buttimer was presented for Cork Primary Games and two of our teammates, Shaunagh McCarthy and Amy Bowdran were awarded for representing Cork at Under 17 level. The club took the opportunity on the night to thank out-going Secretary Cait MacManamon and out-going Chairperson Paddy Lucey for all they have done for Ladies football in Ballincollig over the years. While both remain important members of the club, their commitment to the development of the Club was recognised and acknowledged. The girls then had a chance to show off their dancing skills as they enjoyed their disco. Many thanks to Ballincollig GAA, Richie and all the Bar Staff for all their help organising this wonderful evening.